Our base of operations is in the historic Clarksville School at the corner of Rte. 145 and West Road in Clarksville, N.H. Our building is a circa 1850 sawmill, originally located on Bear Rock in Stewartstown. It was moved to Clarksville shortly after World War I to serve as the Clarksville Dairy Company, Inc. In 1935 the cheese factory became the Clarksville School for students in grades 1-8. The school closed in 1968 and the building remained vacant until we purchased it and it has been our home and office since 1971. 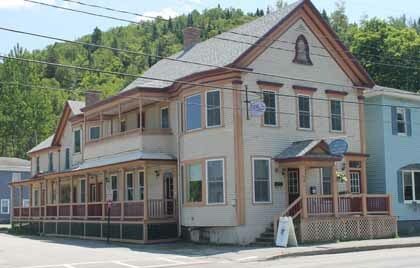 We also have a downtown Colebrook office at 82 Main Street in the historic Williams Building. Since then, we have published Coos Magazine, Northern New Hampshire Magazine, The Colebrook Chronicle and The Lancaster Herald from this office. In 2008, we merged the Lancaster Herald with The Colebrook Chronicle and the two newspapers became one.